What is the use of ROW function? 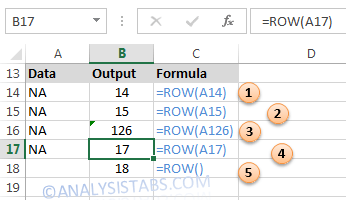 ROW Function in Excel returns the row number of the given reference. What is the syntax of ROW function? Example 5: if you miss the argument it will return the row number of the cell where you have written the formula. Please refer the below article for more Lookup & Reference Excel functions.